The Konica Minolta Group conducts all of its corporate activities in harmony with people and the environment by integrating environmental, economic and social perspectives into our corporate strategy, as the Environmental Policy of the Konica Minolta Group. To this end, the Group has established a group wide ISO 14001-based management system that ensures economically efficient and effective environmental management. Under this system, all Konica Minolta Group employees are committed to continuous environmental improvement activities, in keeping with the Environmental Policy. Central to our environmental activity promotion structure is the Group environmental management representative (environmental executive officer of Konica Minolta Holdings), who is appointed by the President and CEO of Konica Minolta Holdings. The Environmental Management Committee is the highest organization to deliberate on environmental measures, which include the development of our mid-term environmental plans. Led by its Chairman, the Committee comprises environment management officers of business and common function companies, and is empowered to take the initiative in appropriate action throughout the entire Group. The Environmental Management Representatives' Committee, a subordinate body of the Environmental Management Committee, determines Konica Minolta Group environmental goals for each fiscal year. On a quarterly basis, the Committee feeds back the results of the evaluation as to how well these goals have been achieved, to ensure that all entities achieve their environmental goals. In line with the ISO 14001 system, we have also established interdepartmental specialist committees to address major environmental issues such as global warming and chemical substances management. 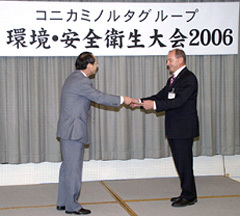 The Konica Minolta Group operates an ISO 14001-based environmental management system as part of our efforts regarding group-wide environmental activities, which are based on unified criteria, stipulating ISO 14001 acquisitions by all manufacturing affiliate companies worldwide as a fundamental Group policy. To address environmental issues, including the prevention of global warming and working toward a recycling-based society, we should implement measures in consideration of the entire product lifecycle. To accomplish this, the Konica Minolta Group believes that it must operate not only its manufacturing sites, but also its product development, sales and distribution sites, under an integrated management system and in mutual cooperation. Based on this concept, in Japan, the Konica Minolta Group has acquired multi-site ISO 14001 certification, so that the entire Group can be managed under a single ISO certification. This has enabled prompt and efficient environmental activities throughout all product lifecycle stages. Under this integrated management system, we are working to reduce environmental impact. For instance, we are promoting the sales of energy-saving products that help reduce CO2 emissions when our products are in use, and are encouraging the collection of used products. This system is also effective in carrying out our activities toward minimizing the environmental load generated directly by our Group companies, such as energy consumption during production, waste generation, and paper consumption. For these activities, we have set up numerical targets. The entire Group periodically evaluates how well these targets are being achieved, and evaluation results are fed back to relevant entities to ensure continuous improvement. Additionally, at least once a year we conduct internal environmental audits based on unified criteria, to ensure that the Group's environmental policy, objectives and targets are properly known to all organizations, and that the management system is functioning efficiently, by identifying any problems and making necessary improvements. In these internal audits, in addition to management system checking, compliance audits are performed using environmental checklists, to ensure that all Group organizations are fully compliant with laws and regulations. By making the maximum use of this integrated management system, the Konica Minolta Group works to ensure compliance, fulfilling its social responsibility by helping resolve urgent environmental issues relating to global warming and zero waste, and by reducing environmental risks. To promote efficient implementation of the concept ”Management Based on Facts,“ we have established an environmental data system known as ”Eco-Solution (ESOL),“ which came into operation in April 2004 at all Konica Minolta business sites in Japan. ESOL has enabled us to collect and compile environmental load data in a speedy manner, contributing to continuous performance improvements. We offer environmental education and self-development programs to improve the environmental awareness of our employees around the world. In Japan, all necessary education is provided for all employees. Specifically, environmental courses have been set up as part of our position-based training programs, starting from a training course for newly hired employees. Environmental courses are also included in the curriculum at Konica Minolta College. 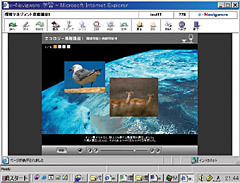 At Konica Minolta Business Solutions Japan Co., Ltd., and Konica Minolta Medical & Graphic Technosupport Co., Ltd. (both sales and service companies), we have adopted e-learning throughout Japan to improve the environmental education efficiency of our sales and service staff, for whom integrated education would otherwise be difficult. Specifically, in fiscal 2006 we began to provide e-learning programs specifically designed to identify and improve the capabilities of employees engaged in work relating to industrial waste and chemical substances, in addition to general environmental education programs for all employees. Furthermore, we hold annual Environmental Lectures in Japan as a means of encouraging employee self-development. In fiscal 2006, we invited Ms. Yuko Sakita, a journalist and Environmental Counselor, to present a lecture on the theme "Toward a Healthy, Beautiful, Prosperous, and Sustainable Future: Environmental and Social Contribution by Enterprises and the Roles of Citizens." We also present the annual Konica Minolta Environmental and Occupational Safety and Health Award. Open to all Group employees worldwide, this Award was established as a means of recognizing outstanding achievements in environmental protection, as well as in safety and health. In fiscal 2006 eleven awards were presented, further encouraging activities to improve environmental/safety and health activities within the Group. The Konica Minolta Group strictly adheres to laws and regulations, in terms of both the environmental preservation measures implemented by its business sites and the provision of environmentally sound products and services. To ensure adherence, we collect, analyze and share the latest information on legal stipulations pertaining to business activities throughout the world. Each business site (primarily manufacturing sites) operates under self-management standards more stringent than legally required. For example, they comply with air/water quality, noise and waste disposal management in line with ISO 14001 system standards, achieving a very high standard of risk management. In terms of product regulations, we also incorporate forward-looking information into our activities—for example, in order to reduce potentially harmful chemicals in advance of any requirement to do so. Specialized internal auditors periodically review our legal compliance in Japan, an activity that will be expanded to our overseas operations as well. We survey our business sites in Japan that have a history of using chemical substances, which may have caused soil or groundwater contamination. If any contamination of soil or groundwater is found at our business sites, we implement regular inspections for more reliable management, so as to prevent identified pollutants from impacting the neighborhood. To facilitate purification of contamination and prevent any further spread, a specialist team has been organized. Under the team's supervision, we carry out detailed examinations to work out decontamination measures, and study purification technologies. Based on the results of these examinations and studies, we are further strengthening our purification activities. The outcome of these activities and inspection results are regularly reported to the local government agencies concerned and to neighboring communities, so as to obtain their understanding. Fluorine Regarding contamination by fluorine found in fiscal year 2005, we have completed remediation work for most of the affected areas by soil replacement. Although some contamination remains at areas located directly underneath buildings where remediation is not possible, we have confirmed through groundwater inspections that no impact has spread to the surrounding region. Hexavalent chromium The pump-and-treat process has been continued, with a lifting pump installed on the site. We have confirmed that numeric data values at observation wells around the site perimeter are being maintained within environmental standards; therefore no impact has spread to the surrounding region. Lead, arsenic, boron, cadmium, fluorine Detailed examinations of soil and groundwater conducted since 2005 revealed higher levels of contamination by lead, arsenic, boron, cadmium, and fluorine than permitted by environmental standards. However, such contamination is confined within the site, and the local government has confirmed that the water quality in rivers in the surrounding region has not been affected.Currently, we are promoting purification measures in consultation with the government agencies concerned. Hexavalent chromium As for the area contaminated with hexavalent chromium, we commenced remediation by soil excavation and replacement in fiscal year 2005, and completed excavation and backfill work in December 2006. Based on the result of such work, we reported the completion of the remediation to the government. c-DCE We have continued with the pump-and-treat process. Lead, arsenic, cadmium Contamination is within a limited area and has not impacted the groundwater quality. We will continue to monitor the status. c-DCE We have continued remediation measures centering on the pump-and-treat process. We have also identified the aquifer containing contaminated groundwater and promoted purification using a method combining gas absorption and the pump-and-treat process. Thus remediation is under way as scheduled. c-DCE Purification via bioremediation, commenced in fiscal year 2004, has been implemented as planned. At all observation wells within the site, the level of contamination has become equal to or below the environmental standards. c-DCE Levels of TEC, PCE, and C-DCE are equal to or below the environmental standards, at many observation wells. The contamination with hexavalent chromium was remedied by excavation in fiscal year 2005. Although some contamination remains at areas that are located directly underneath buildings where excavation is not possible, we have confirmed through groundwater inspections that such contamination has not spread outside the site. We are continuing inspections and the pump-and-treat process to address this contamination. c-DCE Measures are under way to prevent the contamination from spreading beyond the existing area by installing a penetration response barrier, and through bioremediation. Detailed examinations were conducted to identify the pollution source at the site. To decontaminate the detected area of contamination, in 2005 we launched a remediation program combining gas absorption and the pump-and-treat process. This program is currently in progress. c-DCE The pump-and-treat process was suspended; purification via bioremediation was commenced in 2004.Status monitoring continues. Promoting Green Procurement across the Board. Konica Minolta has been promoting Green Procurement by participating in the Green Procurement Network (GPN) ever since the Network's establishment in Japan. When procuring various items, including stationery, OA equipment, company vehicles and the paper and ink used in our own publications, we continue to select those items that have less environmental impact across the entire product lifecycle.